Rancho Cucamonga – Toby Keith Bar is Open – What this means for Real Estate Here ? 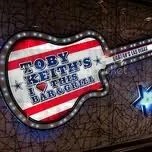 After months and months of anticipation The Toby Keith’s doors are open. Last week I went there with some co workers. It really was a great time. The bar is shaped as a guitar, how fun is that? They also had a live band. I really enjoyed myself, if you haven’t had the opportunity to go yet make a point to check it out. I had tons of fun. A few things to consider, the service is slow, some of the bar tenders do not know how to run a tab, and some drinks they do not know how to make….even though they are on their menu. But HAY I had fun and they are new still learning their systems..didn’t we all when starting a new job or business. Let’s give them a couple of months and I am sure they will be dialed in. For the big question, what this means for home growth in Rancho Cucamonga? This couldn’t be better for home growth for us, Toby Keith only has 4 bars open, they did all the research for us and are only going to open bars in growing areas. This will only boost our economy here. We should be seeing more and more people either moving to Rancho Cucamonga or more home construction.